You are at:Home»archive»Sackville Tower: A picture is worth a thousand words……..
1. 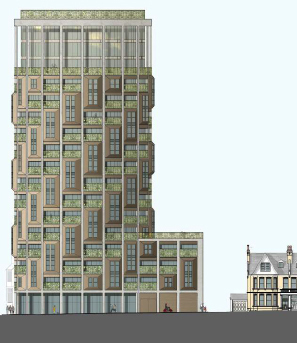 A very tall building – into which category this proposal falls (SPG15 para 5.2) – is a totally inappropriate, unsympathetic and out of scale solution for this site. The character of Kingsway – and currently the whole of the seafront west of Sussex Heights – is composed of buildings of a relatively consistent height of low to medium rise, generally within the range of four to six storeys, with the occasional exception being a storey or two higher or lower. Visually this acts as a continuation of the ordered horizontality of the Regency Terraces of Brunswick and Adelaide to which the world renowned image of Brighton and Hove’s seafront owes so much. It is of vital importance that this essential character created by buildings of a relatively consistent height is continued along the whole of the seafront, and is not marred by very tall buildings which fail to respect the value of the historical precedent set by Brighton’s best buildings, and the visual quality that consistency of height of those buildings and most of their successors, brings with it. 17 storeys is over twice that height. Para 5.2 of SPG15 also states: ’Any new building of 18m or taller (approximately 6 storeys), which is significantly taller than surrounding buildings should be located within the areas described in section 8. “In order to establish whether a building is significantly taller, applicants will be required to provide an assessment of the mean height of surrounding development; this assessment will extend to 100 metres in all directions from the proposed footprint. Although this proposal is located in one of the tall building zones, its proposed 17 storeys is significantly taller than ‘mid-rise’ (6 – 8 storeys), and very considerably taller than the houses in the Sackville Conservation Area and adjacent residential streets. We therefore consider that an assessment of the mean height of surrounding development should apply equally to this site as to any other within the city, and the results of that assessment – which we think would be interesting – should be a relevant consideration in determining whether the application should or should not be approved. In our view the 17 storey proposal drives a horse and cart through the intentions expressed in SPD15. On these grounds alone it should not be permitted. The site lies within this Conservation Area – a designated Heritage Asset. As such, the Council has a duty to pay special attention to the desirability of preserving and enhancing the character and appearance of the Conservation Area. It also has policies within its own City Plan which are designed to protect those Heritage Assets within the City. The illustration on the first page of our objection shows the monstrous difference between the 17-storey tower proposed and its immediate neighbour on Sackville Gardens. How this could ever be interpreted as ‘preserving and enhancing the character and appearance of the Conservation Area’ defies belief. This 17-storey building is totally out of scale and character with the Conservation Area and will have a drastically detrimental effect on the Sackville Gardens Conservation Area. On these grounds alone it should not be permitted. We recognise the need for more housing in Brighton, including the need for high densities so that the land within the city can be used as efficiently as possible. We support the development of vacant sites such as this for new housing, (though we do not subscribe to the myth that high density necessarily means tall buildings). That said, there are some sites which are appropriate for high densities and some which are not. This site is too small to accommodate the 98 dwellings proposed. It is totally out of scale with the existing pattern of development along Kingsway, the future ‘mid-rise’ pattern envisaged in SPD15, and especially so when judged alongside the character and scale of the Conservation Area in which it is situated. The applicants argue that their proposal is justified because of the failure of the Council in its draft City Plan to meet the target of 30,000 new dwellings in the period up to 2030. This is in spite of the fact that they admit in the same documentation that the Council has confirmed that the application will be decided on the basis of the policies set out in the current and draft City Plans -which is the entirely correct response. The general approach appears to be an attempt to bully and panic the Council into ignoring its own draft City Plan and planning guidelines, on the grounds that otherwise it will fail to meet the government’s (not the Council’s), housing targets. This site is actually very small in area at 0.16 Ha, and the density proposed – at 612.5 dwellings per hectare is ridiculously high. For comparative purposes, the first Anston House planning application – to which we objected, and which was refused in 2013, included buildings of 15 and 12 storeys. That resulted in what we regarded as an excessive density of 385 dwellings per hectare. That was very high by any standards – for example the average density even in Westminster in central London between 2002 and 2006 was only 186 dwellings per hectare. But it pales into insignificance beside the 612.5 dwellings per hectare proposed for the Sackville site. It would be interesting to know the average density of the adjacent buildings along Kingsway and the density of the adjacent 2-3 storey houses in the Sackville Gardens Conservation Area. We suspect that this would demonstrate how completely out of scale this proposal would be within its immediate neighbourhood. This overdevelopment is also illustrated by the pitifully small area of the site devoted to open space – a deficiency which is acknowledged in the application documents. The lack of space also means that car access to the parking spaces has to be by lift. It is inconceivable that this will not lead to severe traffic congestion on the roads outside, as residents trying to enter and leave the building by car jam up the access into the site. The degree of overdevelopment on its own would be suffcient grounds for rejection of this proposal. The circular plan and outward facing rooms mean that the flats on all sixteen upper levels at the back of the building will overlook to an unacceptable degree the rear gardens of many neighbouring houses on residential areas to the north of the site. The building will also cause serious overshadowing of many of these gardens, throughout the year. It will be particularly bad on sunny days during the winter months between the equinox dates. We are unconvinced that there will not be wind turbulence issues resulting from the height of this building. It is well known that tall buildings can cause severe downdraughts. Strong winds – and this is a potentially very windy and exposed site – with prevailing winds hitting the tower from the south-west will cause strong downdraughts on the exposed face of the building and potential low-pressure ‘vacuum’ areas on the leeward side. The circular form of the building makes it difficult to predict the likely effects without detailed wind studies being carried out. Having read the Design and Access Statement, noting the increasingly desperate and repetitive arguments contained within its confused verbiage, only serves to reinforce our feeling that the designers are reluctantly aware that their arguments to justify the height of the building and its relationship with its surroundings and the Conservation Area it lies within, represent a futile attempt to justify the unjustifiable. (i) It is claimed that the bay windows of the houses in the Conservation Area below the tower are the inspiration for the carbuncle-like extrusions attached in a spiralling formation to the sides of the tower. It takes some stretch of the imagination to make this connection. Architecturally there is no no convincing relationship – the two forms are completely unrelated in scale, appearance and context, and any perceived relationship is meaningless. I speak as an architect with over 45 years experience of designing buildings. (ii) One of the reasons given for determining the height of the tower – the Golden Section – is an abstract geometrical concept completely unrelated to the problem of inserting a new building sympathetically into a sensitive Conservation Area setting. When designers have to resort to calling on irrelevant, abstruse and abstract geometric concepts to justify their designs, you know they are in trouble. The design is not impressive. Its appearance is squat and bulky. The relationship between the circular tower and the flat roofed lower parts facing Kingsway and Sackville Gardens is clumsily handled. The interior layouts of the flats create awkward spaces as the plans are necessarily wedge-shaped to fit within the circular plan. The single aspect flats mean that the light levels in the inner spaces towards the central core will receive little light. We are most concerned that if this application is approved it will set a precedent for other developments along Kingsway in the near future. There will be a lot of people looking very carefully at the outcome of this application, and there are several sites along Kingsway which are ripe for redevelopment. In our opinion the Sackville Tower site as proposed is blatantly overdeveloped. It demonstrates an arrogant, not to say irresponsible attitude towards the City Council’s planning policies and guidelines and shows a total disregard, a lack of respect and sympathy to its surroundings, the Sackville Gardens Conservation Area and the residents who live in the area – as well as all the other residents of this city and its visitors who appreciate the quality of Brighton and Hove’s seafront. How many people will ask in years to come if this proposal is allowed to go ahead, “Who on earth approved that monstrosity on the seafront?” It really is that bad. Planning mistakes can’t be undone. This is a defining moment and is likely to set the pattern for the future of Hove seafront for years. We strongly urge the Council to reject this proposal outright.